I can hardly believe this exists! One of the defining periods in the history of the Latin language is the beginning of the Central Middle Ages — at this time, the Romance languages started to emerge more and more as distinct, local vernaculars separate from Latin. However, Latin continued to be used and learned in the same way second languages are today — it was used from Ireland and Britain through the Romance nations across into such far-flung lands as Denmark, Bohemia, Hungary. Latin would not truly ‘die’ as a living (albeit learned) language until the 1800s, as recently argued in Latin: Story of a World Language by Jürgen Leonhardt (Harvard, 2013). I haven’t read all of Leonhardt’s book (full disclosure! ), so I am not sure if today’s musings align with his evidence and arguments. Nevertheless, I shall venture the following thoughts arising from reading Hugh Houghton’s brand-new The Latin New Testament: A Guide to Its Early History, Texts, and Manuscripts (Oxford, 2016). Part I of Houghton’s book is a chronological history of the Latin New Testament, the final chapter of which is ‘The Tenth Century Onwards.’ In the final section of this chapter (pp. 108-110), the ‘rediscovery of Greek’ is discussed. In the twelfth century, knowledge of Greek was returning to Latin Europe; our first bilingual Greek-Latin New Testament after some ninth-century Irish examples is from that century. I have always appreciated the twelfth and thirteenth centuries for their renewal of Greek knowledge — by the time of Thomas Aquinas, all of Aristotle had been translated out of Greek, so the greatest philosopher-theologian of the Middle Ages was able to use that translation rather than the earlier translations from Arabic (that are all that people like to mention, as though Spain were the only place of cross-cultural interaction in the Mediterranean). Houghton notes that we have twelve surviving Greek-Latin bilingual New Testament manuscripts from between the late thirteenth and fifteenth centuries. Now, part of what makes the history of the Latin Bible interesting is its ongoing relationship with the original texts from which it was translated. Jerome revised the Gospels and the Old Testament (I’m not sure how much of the OT, though), and around the same time, other portions were also revised — these revised versions eventually come to be ‘standard’, Vulgate. There were in existence a few varieties of ‘Old Latin’ or Vetus Latina translations of the Bible, and they continued in use for centuries in various circumstances and locations. Many biblical manuscripts show a mixed Vulgate-Vetus Latina text. Jerome was not the only one revising and checking the translations over time; hence the ninth-century bilingual Greek-Latin Irish manuscripts mentioned above. In the twelfth century, for example, Stephen Harding, abbot of Citeaux (the mother house of the Cistercians), undertook a revision of the Latin Bible that still survives. He tells the story of how he consulted the local Jewish community about certain places in one manuscript that had passages not in others; they confirmed for him that these passages were not in the Hebrew originals, so he did not include them in his revised Bible. (This story is translated in The Cistercian World by P. M. Matarasso; Penguin, 1993.) The Latin point of reference in all of these translations and revisions was the language as spoken. The language as living and lived. While Latin was primarily a living language — whether the mother tongue as for Jerome, or a learned language as for Stephen Harding — the primary focus of Greek-Latin biblical scholarship was ensuring the accuracy of the Latin text. Indeed, Jerome explicitly states that he left the style alone unless it affected the meaning because of how beloved the Latin text was in many church communities. Many Bibles provide alternate renderings of the Latin in interlinear or marginal glosses. 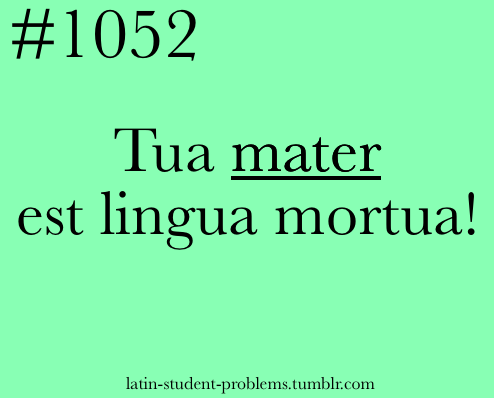 By the day of Erasmus, we see that Latin is in ill health. Its chief ailment is not from some sort of parasitical disease from the vernacular languages; Latin’s place in western European literature and scholarship was assured for a few centuries yet, for an Englishman could read a German’s Latin, but not his Hochdeutsch, and a German could read a Spaniard’s Latin but not his Spanish. The evidence of Latin’s ill health is found in what sorts of changes Erasmus made to his text of the Latin Bible. Erasmus did not simply correct corruptions or inaccuracies in the text. Nor did he simply make the Latin align with his Greek Textus Receptus, the way Kurt and Barbara Aland would in the twentieth-century Nova Vulgata. Instead, he changed the Latin text on the basis of its style and Latinity — a thing not even Jerome did (Jerome, a man who claimed to have been told by Christ in a dream that he was a Ciceronian, not a Christian!). Until then, the Latin Bible had been one of the instrumental and pivotal texts of the Latin world. It was something that represented the ongoing life of the Latin language beyond Cicero. However, as the humanists came to laud and magnify the Ciceronian style, this living Latin began to fall into disfavour. Erasmus’ new Latin Bible is clear evidence of this. Furthermore, the rediscovery of Greek, and then Erasmus’ printed Latin Bible, combined with the Protestant Reformation, led to a reduction in the new of the old Vulgate versions. Scholars and theologians would have access to Erasmus’ Greek edition. Clergy would have access to vernacular translations — Luther’s, Tyndale’s — based on the new Greek editions. The Vulgate would be required for Roman liturgical purposes and as the official text when used in other Roman Catholic contexts. But that is all. Latin’s days were limited, even if the ‘final decease’ of the language would not come for a. few centuries more. Greek, the humanists, and print had begun the slow process that a change in Latin tutelage would ultimately complete. Mind you (I feel compelled to say), Latin is not yet actually ‘dead’, it is merely obsolescent, but still of enormous use, power, and influence. This entry was posted in Ancient World, Books, Christianity, History, Monks and Monasticism, Patristics and tagged erasmus, hugh houghton, jurgen leonhardt, latin, latin bible, st jerome, stephen harding, story of a world language, the death of latin, the latin new testament on July 21, 2016 by MJH.